Back in 2010, an injury ultimately led me to my true calling in life: chiropractic. One day while exercising, I injured my neck and developed a severe headache. The neck pain eventually lessened, but the headaches were still persistent. I decided to get myself checked out at the local hospital, but all tests and diagnostic imaging came back negative. A family member recommended that I should see if chiropractic could help; so I decided to give it a try. The chiropractor ran me through a physical exam and took x-rays of my spine. She explained to me that the vertebrae in my neck were out of alignment and putting pressure on a nerve. She called it a “subluxation”. This, in turn, was the true cause of my headaches. After a few visits to the chiropractor, the headaches went away and never returned. From that moment on, I knew that chiropractic was something very special. After hearing more about chiropractic philosophy and the true meaning of health and wellness, I realized that chiropractic was what I was truly meant to do. My pre-chiropractic career began at Illinois Valley Community College in Oglesby, Illinois. After obtaining all the requirements needed for graduate school, I was accepted to Palmer College of Chiropractic in Davenport, Iowa. 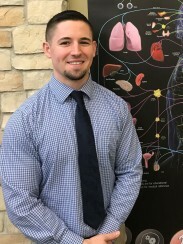 During my time at Palmer College and its clinic system, I completed various courses with emphasis in human anatomy and physiology, nutrition, radiology, diagnosis and case management, and chiropractic technique. I also enjoyed the privilege of working with many individual patients and seeing them thrive through genuine empathetic care.